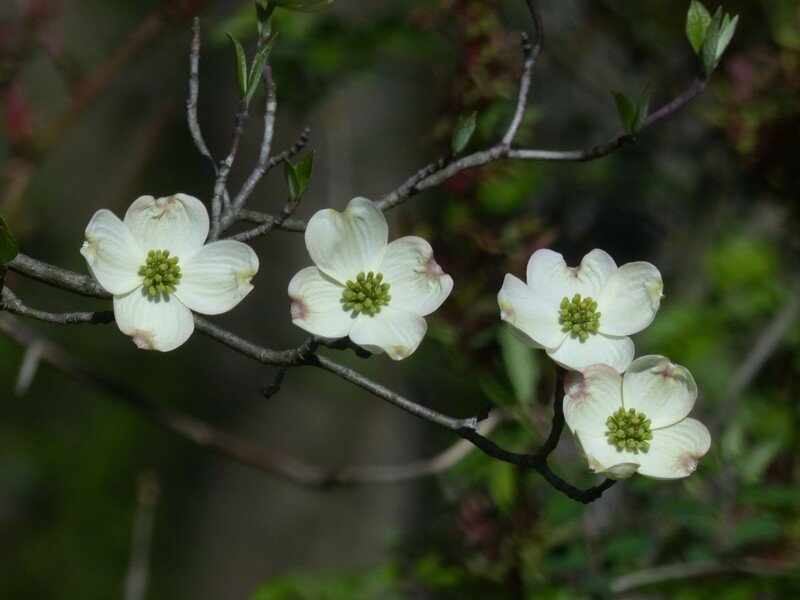 This post is a bit of a ramble covering our adventures in central Ohio nature over the past week. 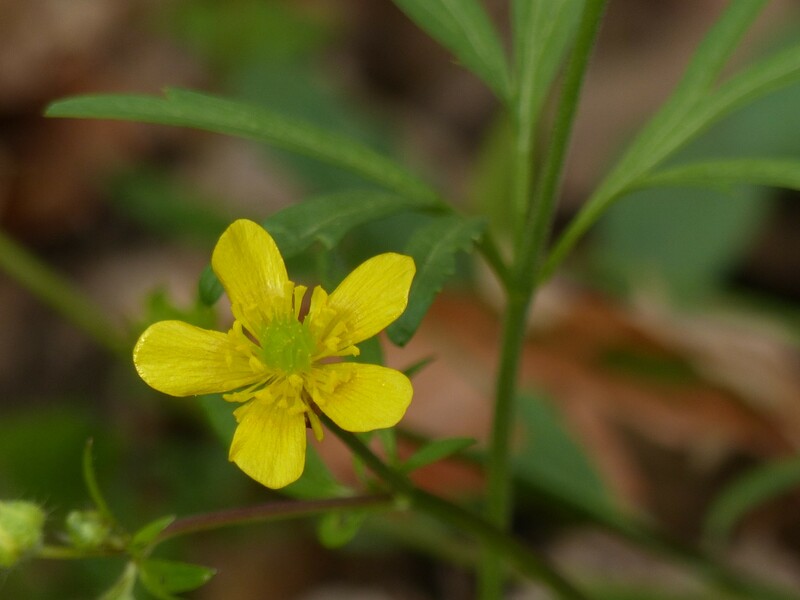 A search for wildflowers and warblers in area metro parks, a visit to a local city park to see if any warblers were passing through and finally the first long kayak paddle of the year. So I hope you enjoy the ride. 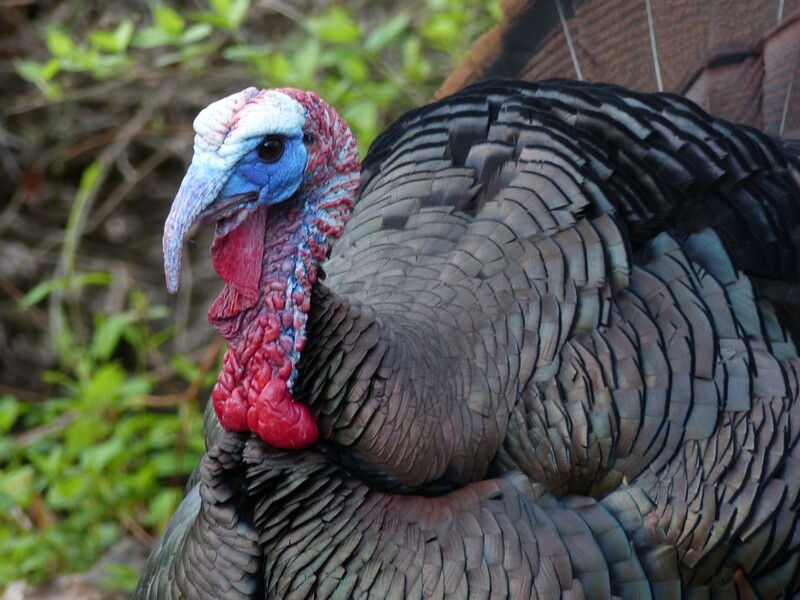 In the spring wildflowers and migrating warblers are usually what comes to mind not turkeys. For me turkeys have always been a fall bird usually associated with a big meal that includes stuffing, gravy, and all the fixins. 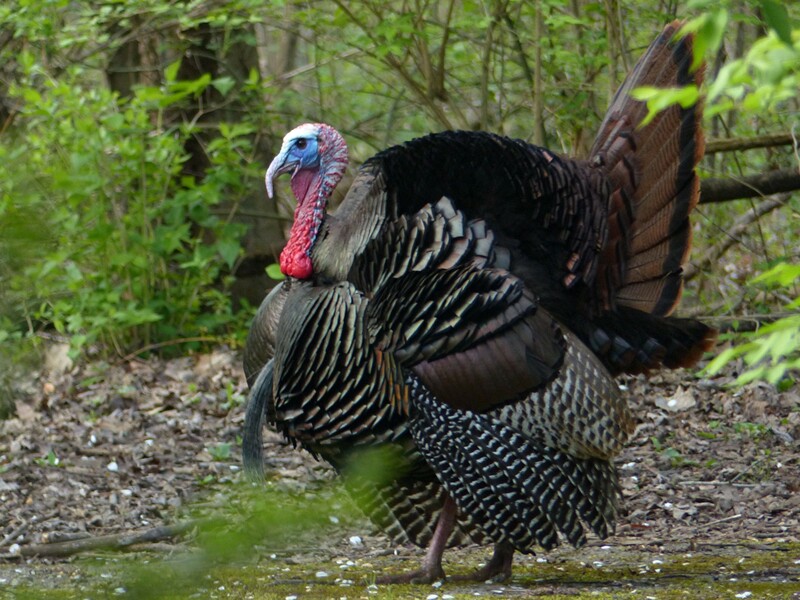 So a few days ago at Blendon Woods Metro Park it was a bit of a surprise to see a male turkey doing it’s best to convince a female that they should get together. A closer look. In breeding plumage the feathers are truly spectacular, (Donna). The purpose of the trip to Blendon was to look for warblers. We were successful in spotting a few including a Black-throated Green which without to much effort eluded the camera’s lens. 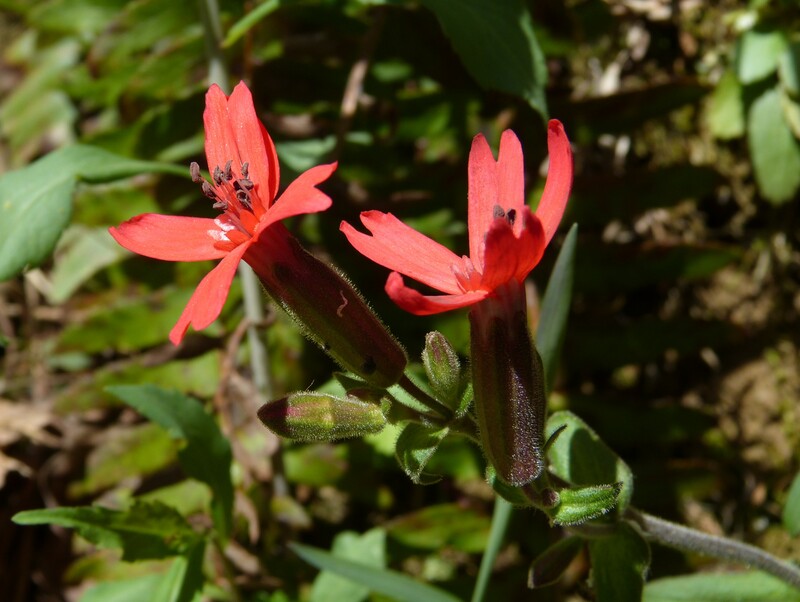 While we did see a few, we soon found ourselves seduced by the many wildflowers that were in bloom. 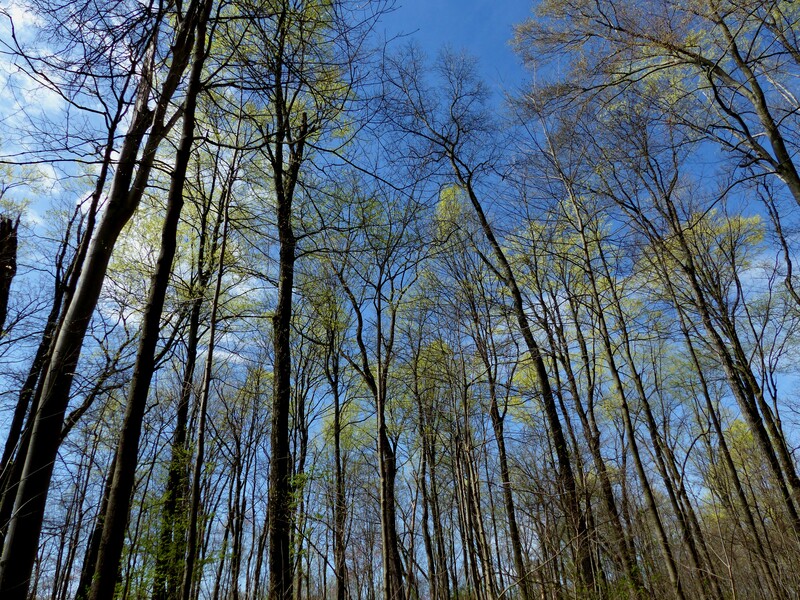 It won’t be long till the leaves fill in, Blendon Woods Metro Park. 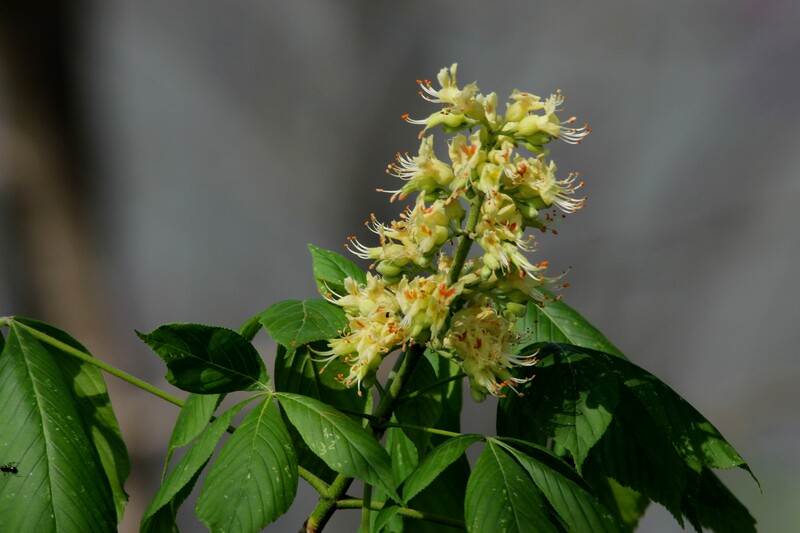 Standing out due to their relative scarceness leaves evoke the feeling of flowers. 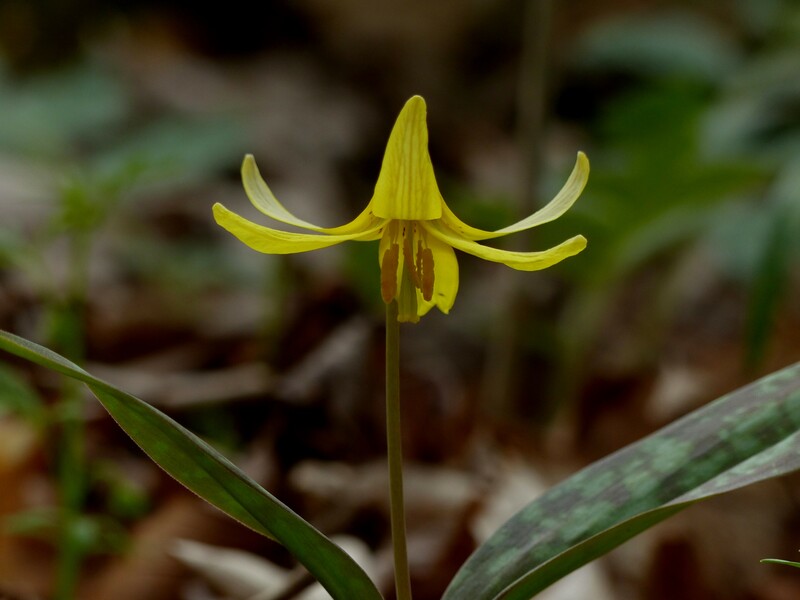 Yellow Trout Lilies were doing their best at Blendon Woods. Another view as sunlight filters through from behind. 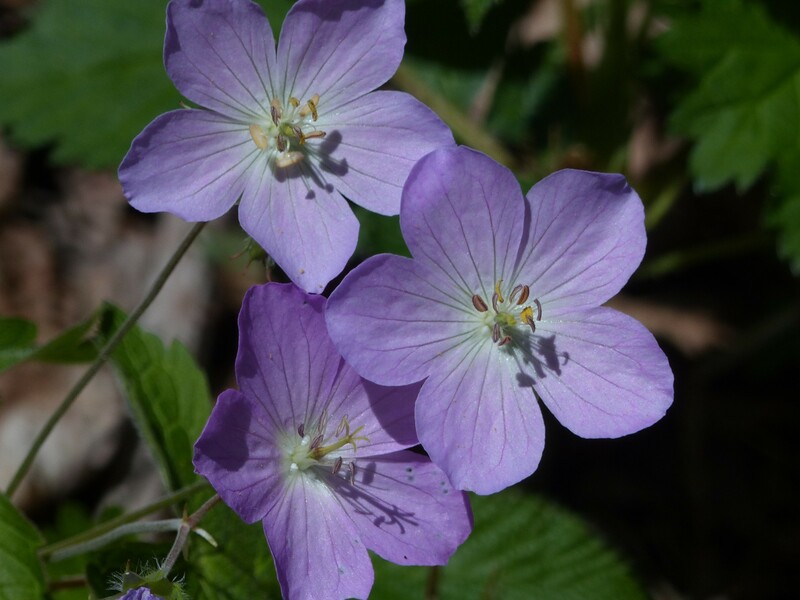 Wild Geranium, Blendon Woods, (Donna). 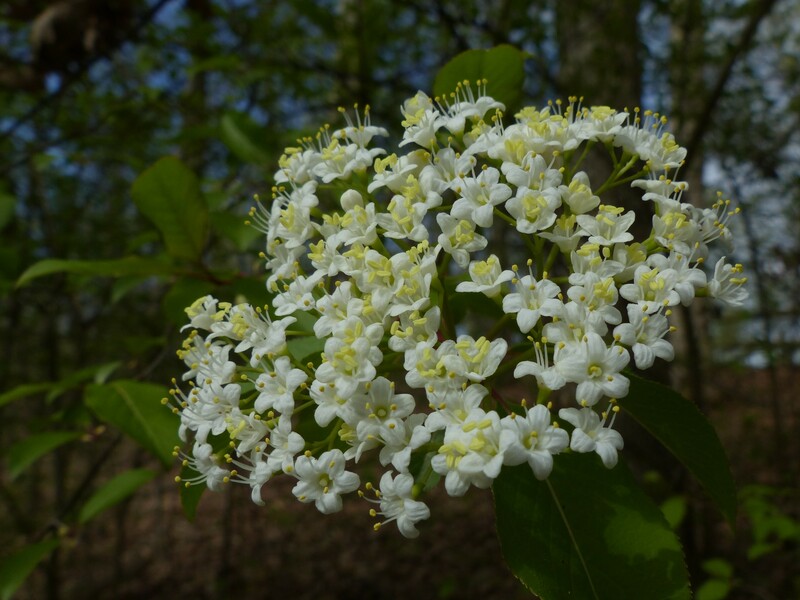 Black haw viburnum, Blendon Woods. 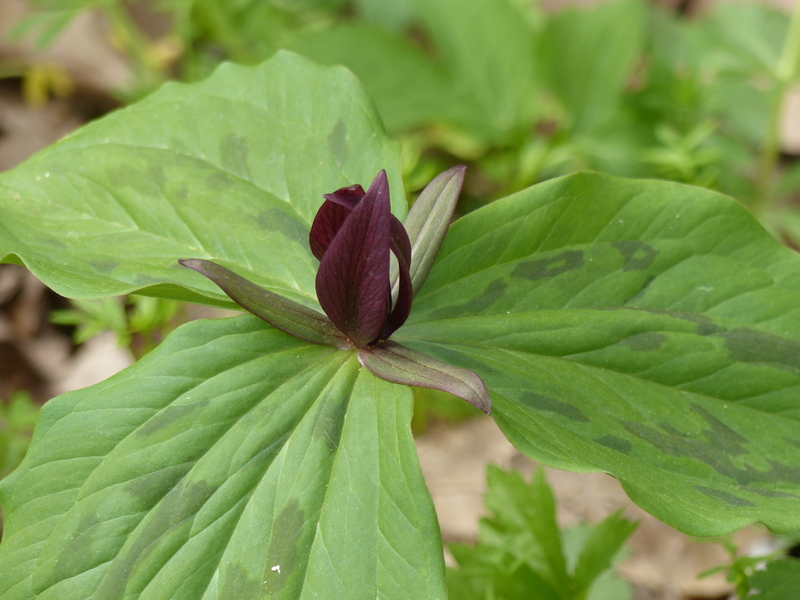 There were some exceptional large examples of Toadshade Trillium at Blendon Woods. Flowers aren’t the only thing worth taking a close look at. Jacobs Ladder, Blendon Woods, (Donna). 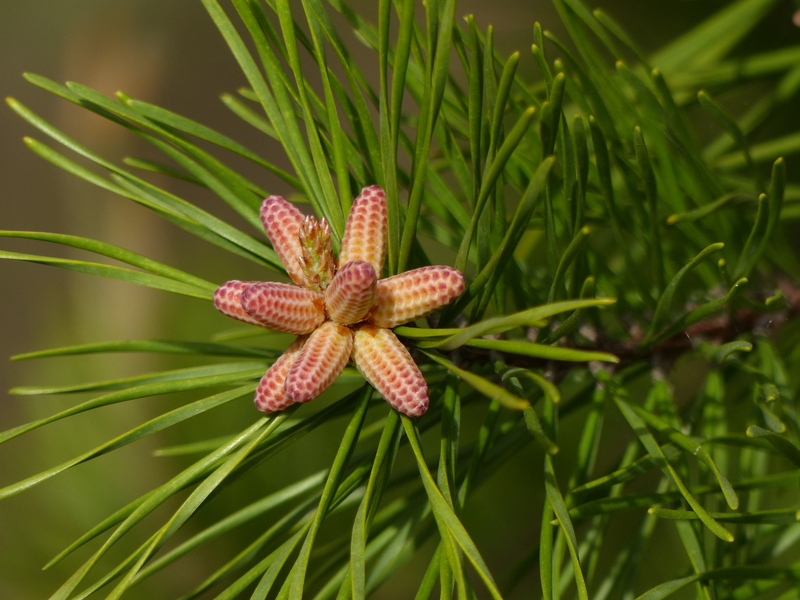 When not looking at wildflowers or for warblers there were other things . . . 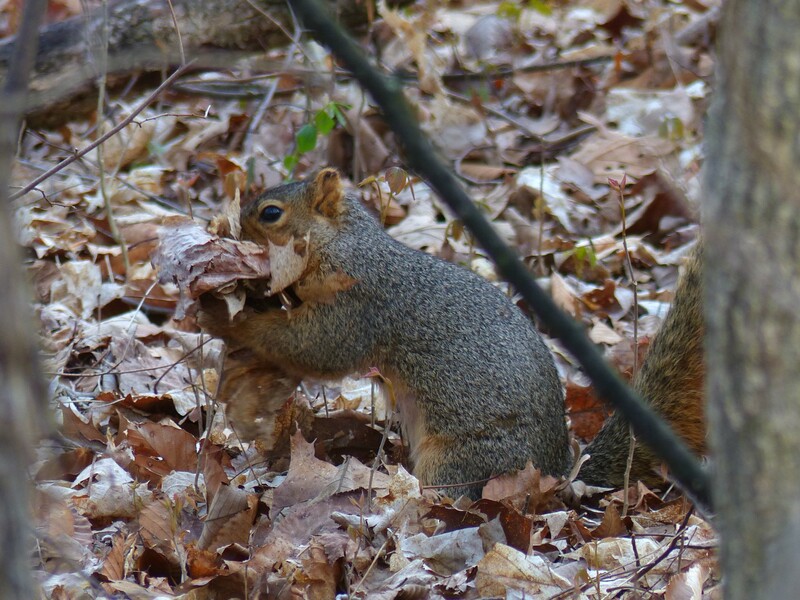 Birds are apparently not the only spring nest builders, Fox Squirrel, Blendon Woods, (Donna). 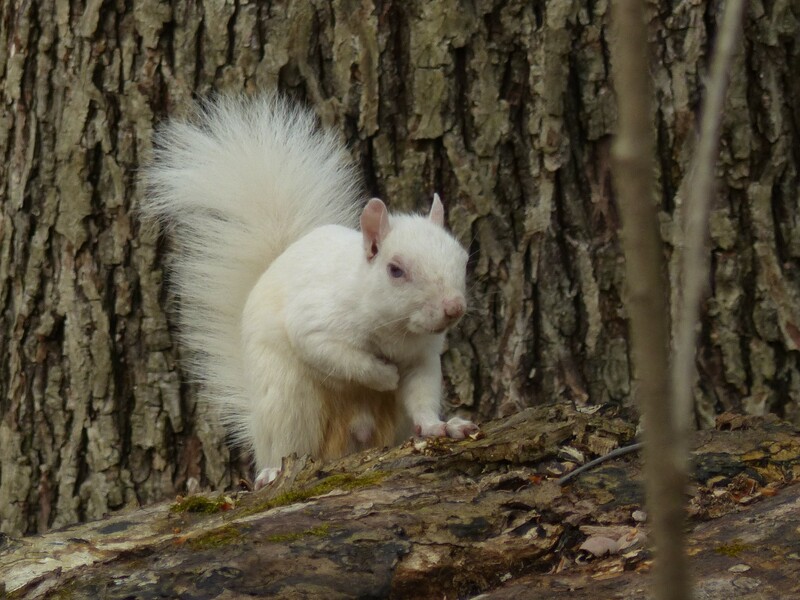 One of a least two mature albino squirrels seen. How they evade the hawks long enough to reach adulthood is a mystery to me. 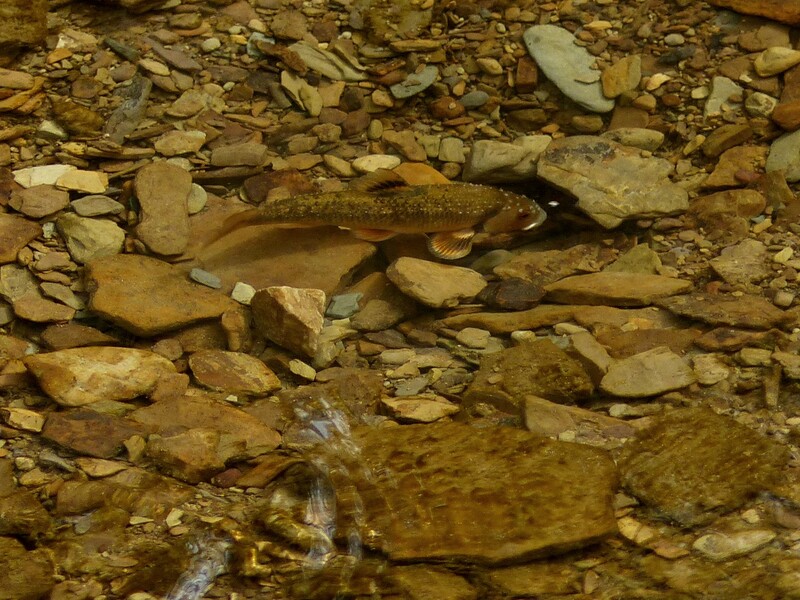 Home to small darters, in the spring the small creeks in Blendon Woods flow freely. The day following our trip to Blendon Woods we headed to Clear Creek Metro Park for what turned out to be a rather long hike. 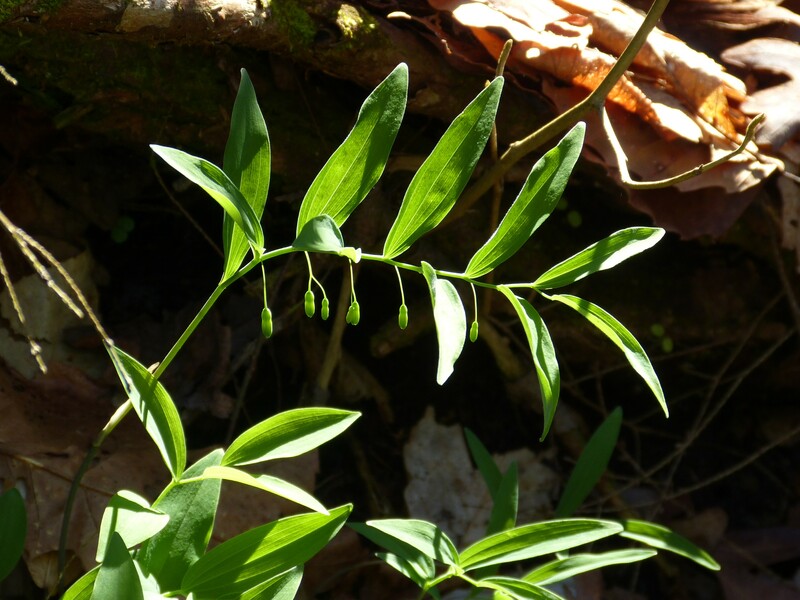 Spring is especially fascinating at Clear Creek with a number of plants not found elsewhere in Ohio. The number of butterflies seen (Eastern Tiger Swallowtails, Commas, Morning Cloaks, etc.) but not photographed, was truly amazing. 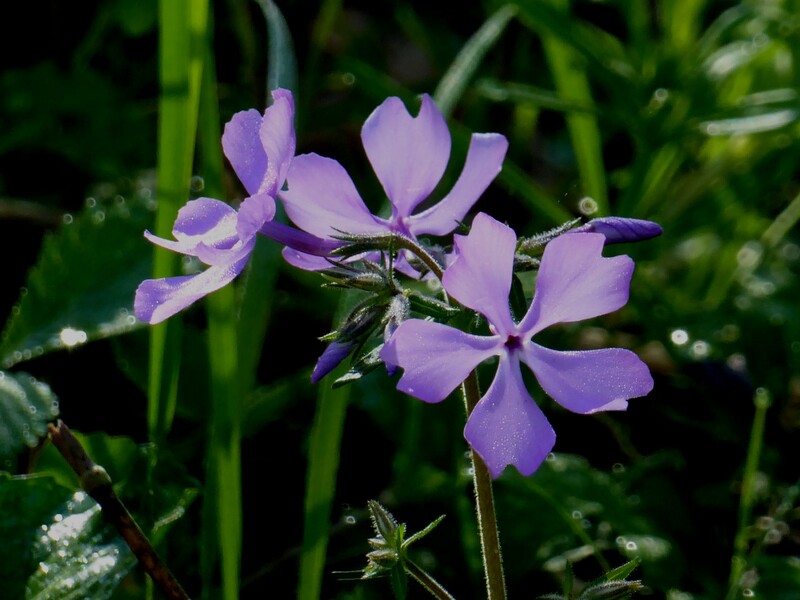 Blue Phlox, Clear creek Metro Park. 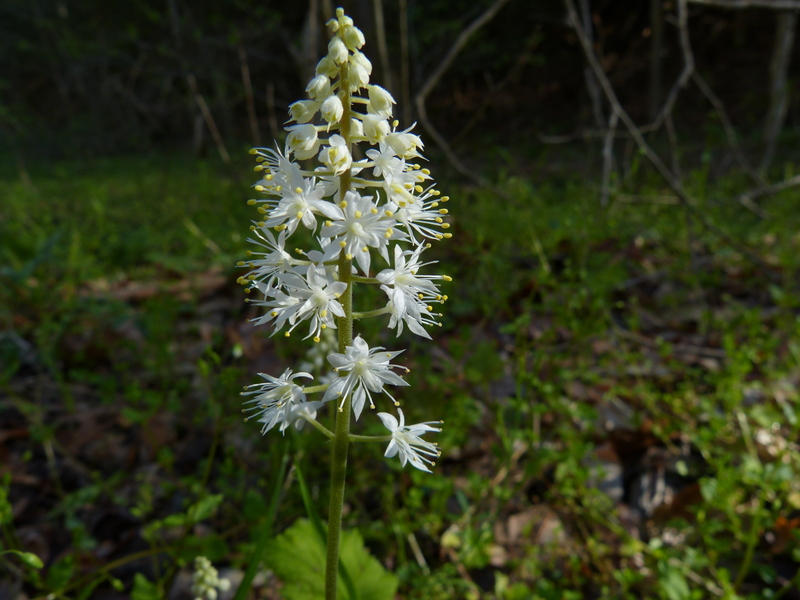 Foamflower, Clear creek Metro Park, (Donna). 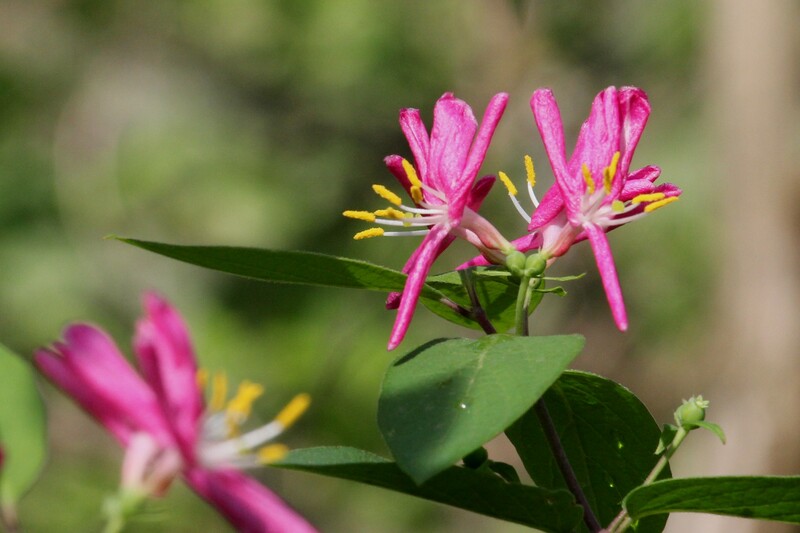 Pussytoes (F), Clear Creek Metro Park, (Donna). 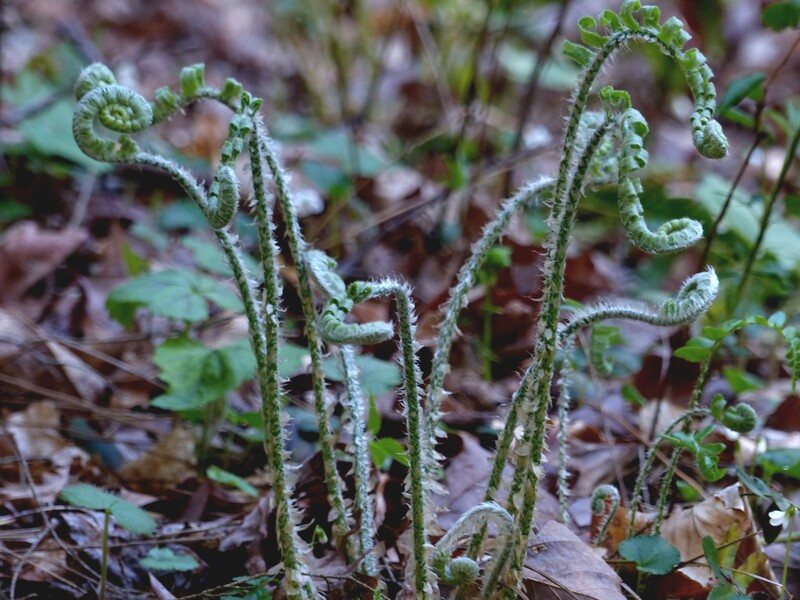 Fiddleheads, Clear Creek Metro Park. 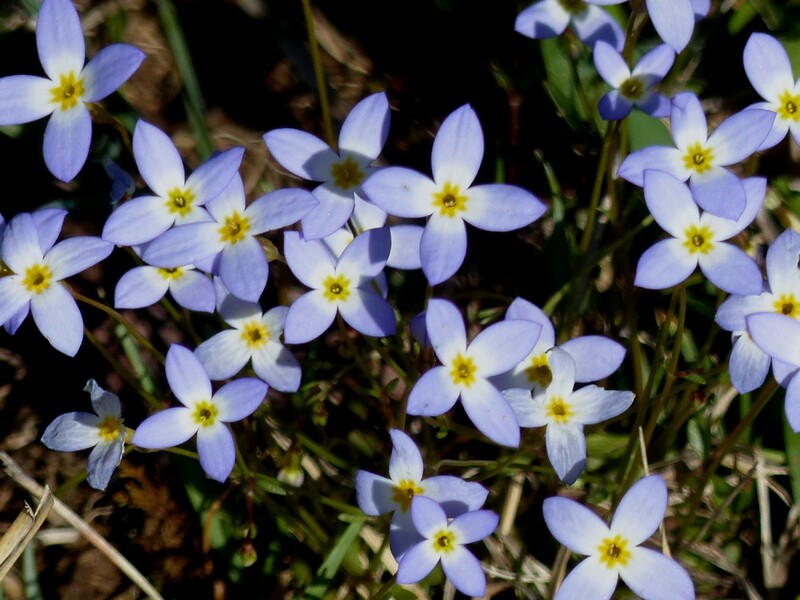 Bluets, Clear Creek Metro Park. Soloman’s Seal, Clear Creek Metro Park, (Donna). 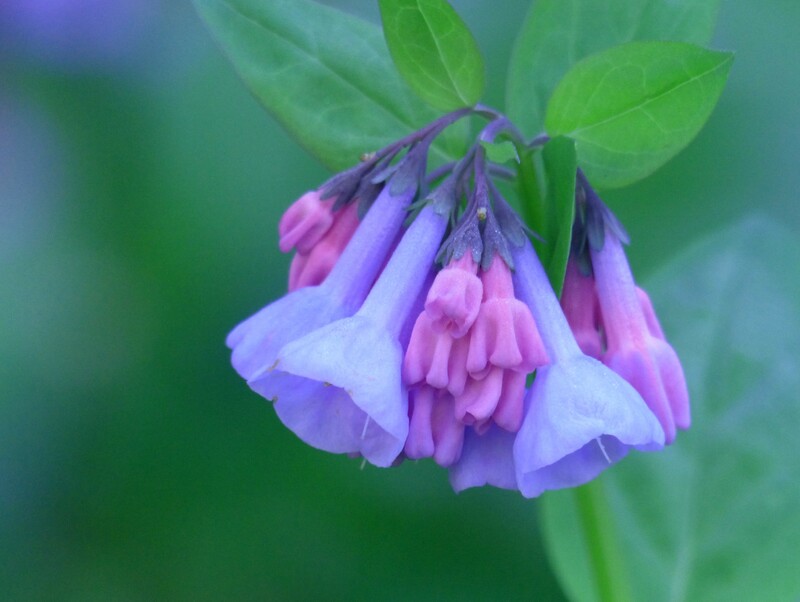 Virginia Bluebells, Clear Creek Metro Park. 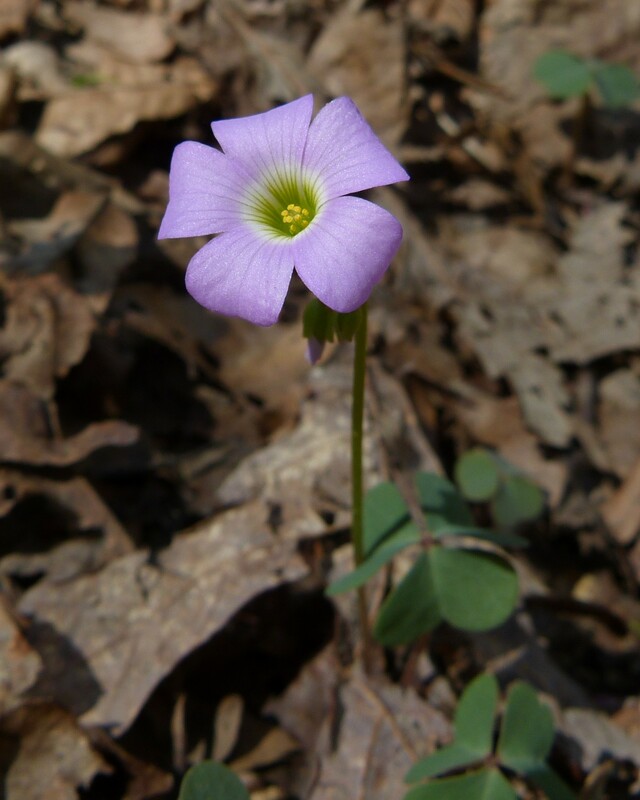 Violet Wood Sorrel, Clear Creek Metro Park, (Donna). Spicebush Swallowtail, Clear Creek Metro Park, (Donna). 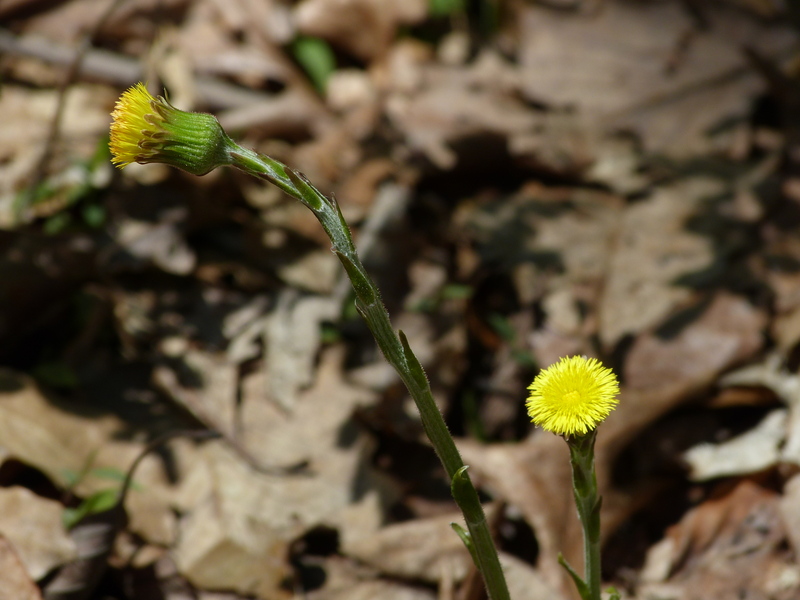 Coltsfoot, Clear Creek Metro Park, (Donna). 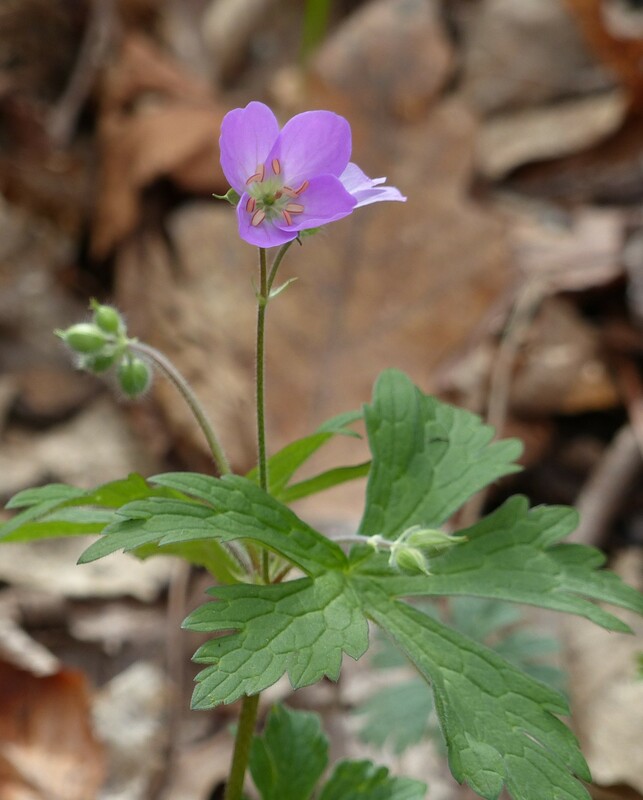 Wild Geranium, Clear Creek Metro Park. (Donna). 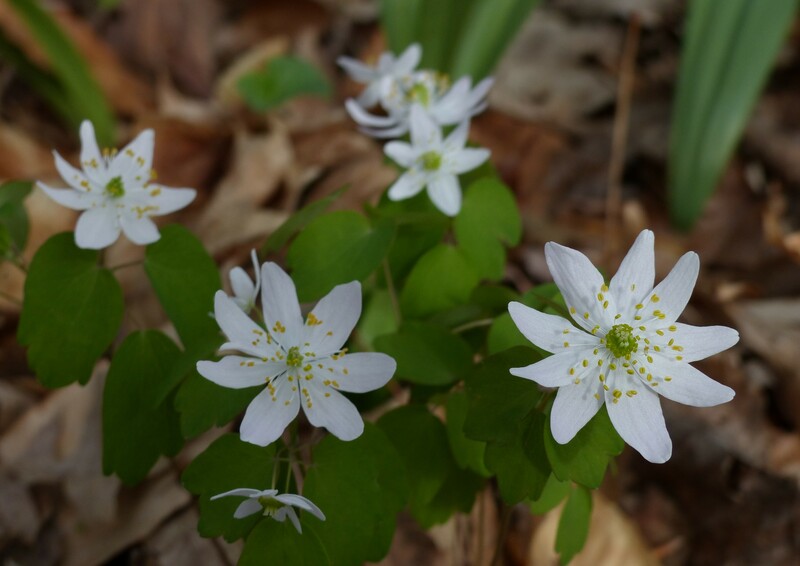 Rue Anemone, Clear Creek Metro Park, (Donna). 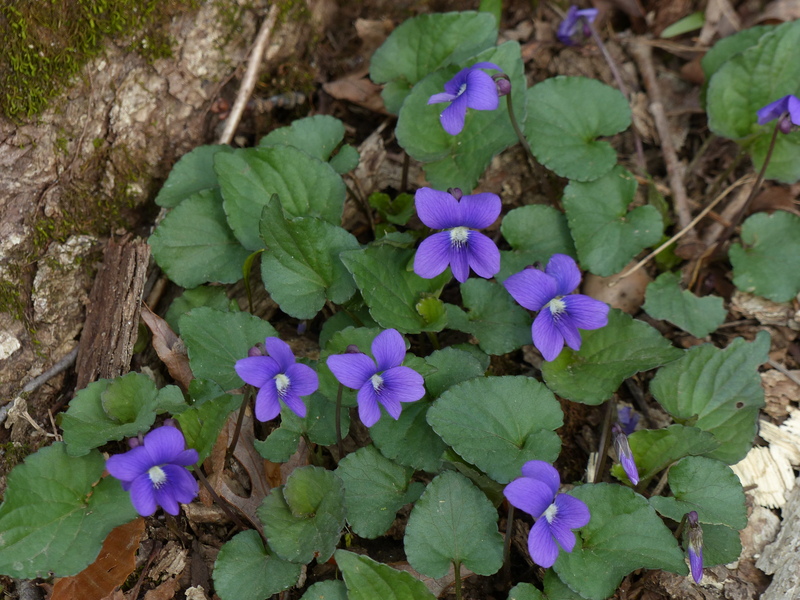 Violets, Clear Creek Metro Park, (Donna). 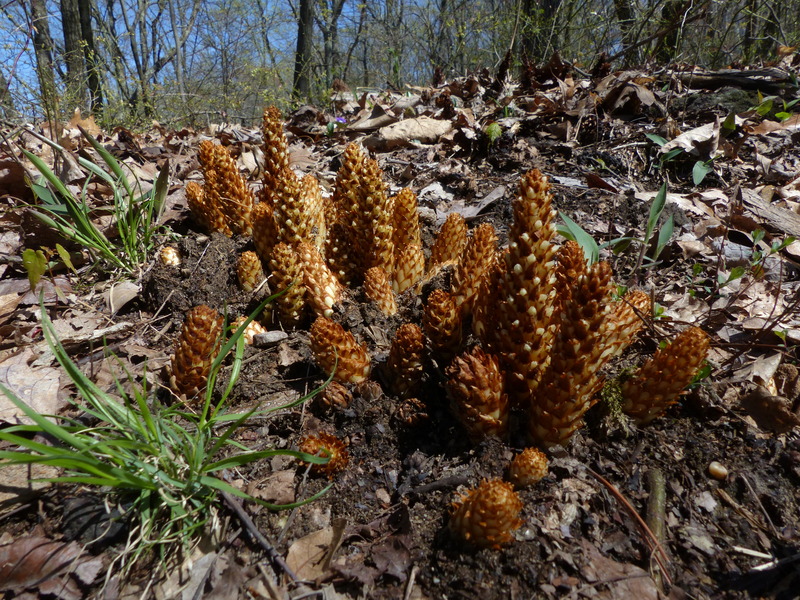 Squaw Root, a perennial, non-photosynthesizing parasitic plant, native but not endemic to North America, when blooming resembles a pine cone or cob of corn growing from the roots of mostly oak and beech trees, (Wikipedia), Clear Creek Metro Park. Fire Pink, Clear Creek Metro Park, (Donna). Closer to home within the city limits of Columbus along the Scioto River and Griggs Reservoir spring was also in full swing. 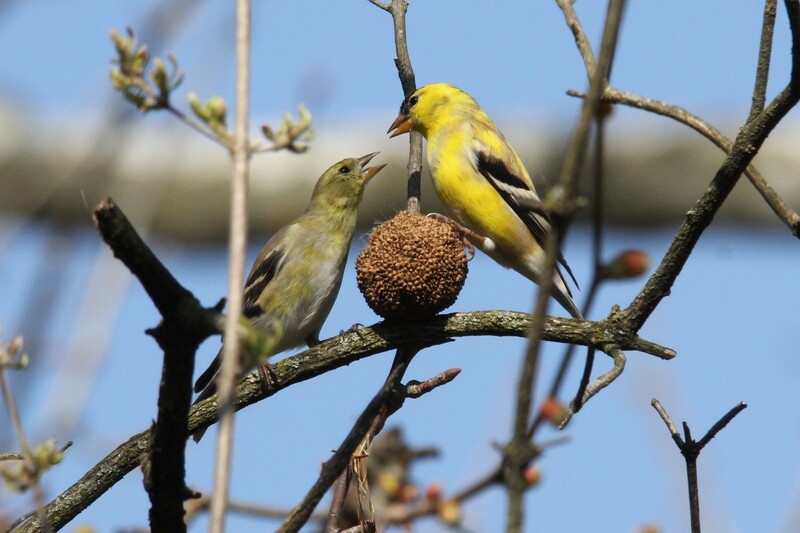 “Lovebirds”, male and female American Goldfinch, Griggs Park. 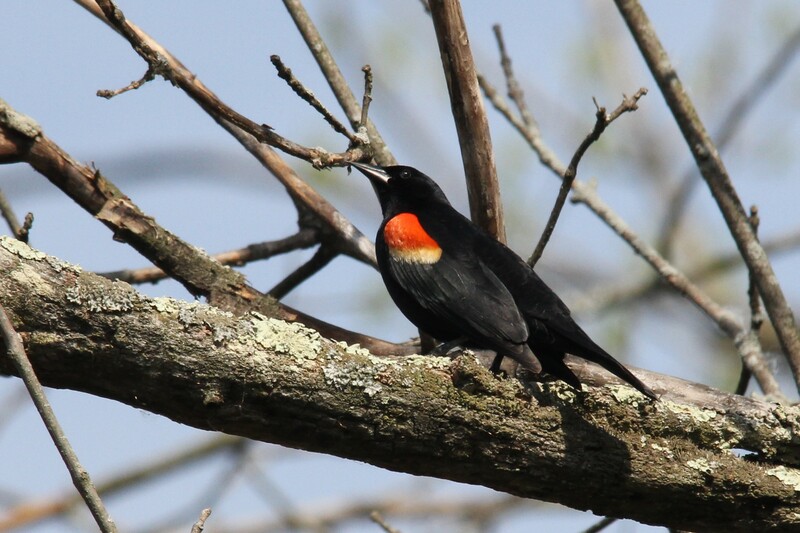 Redwing Blackbird (M), Kiwanis Riverway Park. 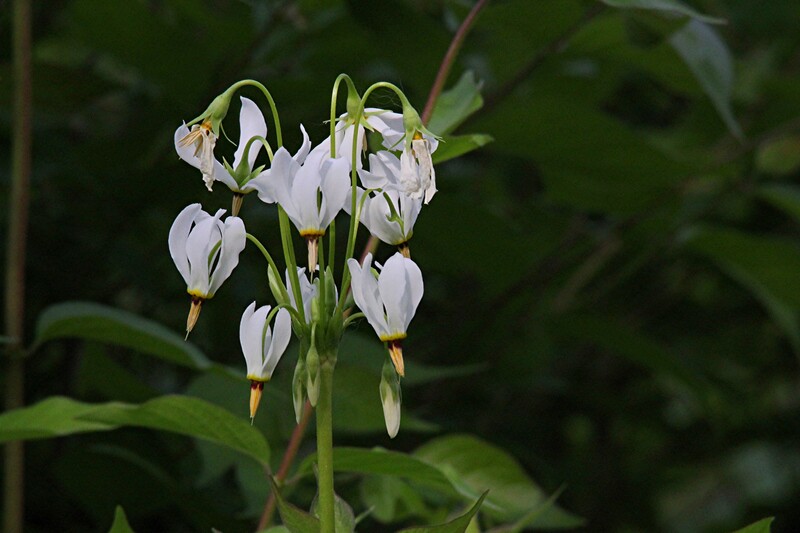 Shooting Star, Kiwanis Riverway Park. 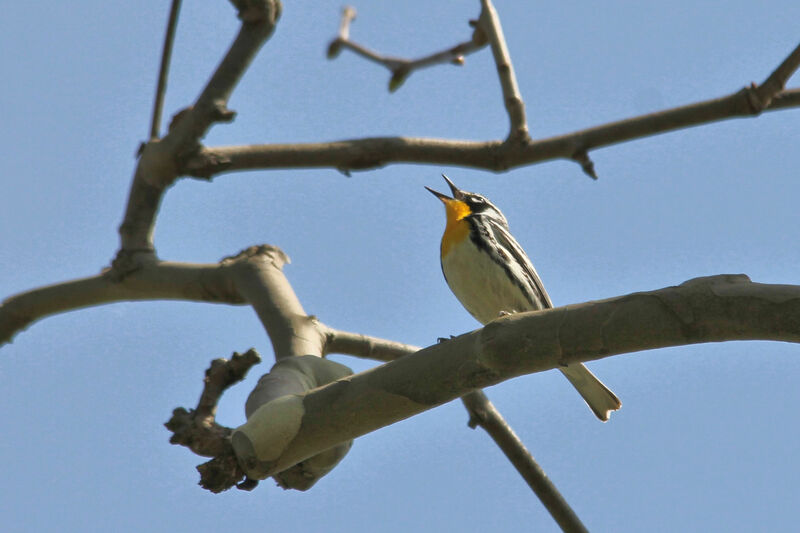 Yellow-throated Warbler singing high in a Sycamore tree, Griggs Park. 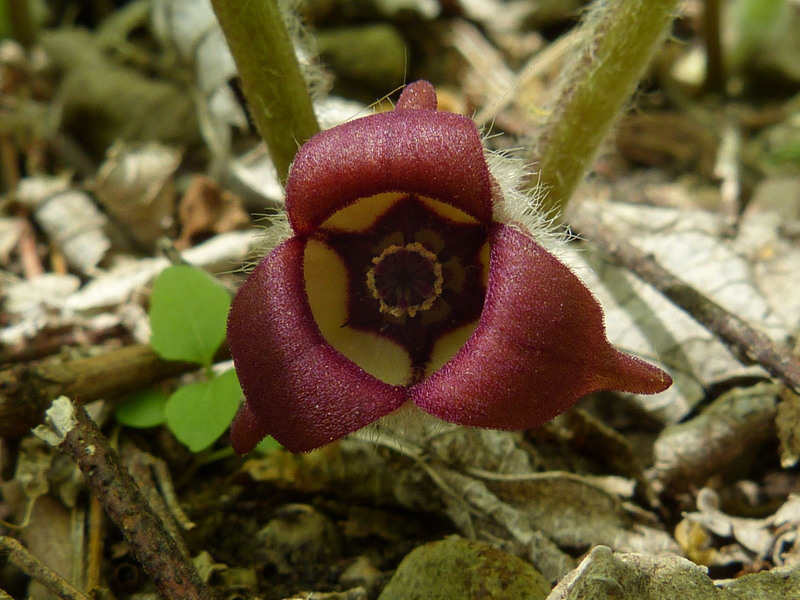 Wild Ginger, Griggs Park, (Donna). Out on the reservoir there was also lot’s of activity, much of which eluded the camera’s lens, but some subjects cooperated just long enough. 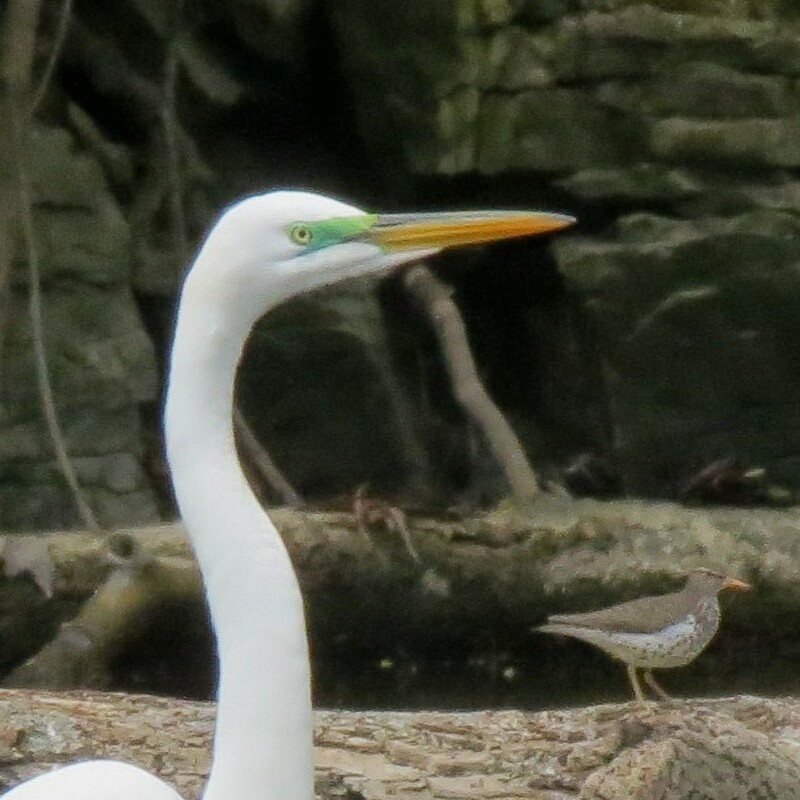 Spotted Sandpipers, turtles, Great Blue Herons, and Great Egrets seemed to be everywhere. As I have undoubtedly mentioned in the past, shooting from a canoe or kayak has it’s own set of challenges, camera shake and the fact that everything is moving just to name a few, so when one gets a relatively good picture it’s truly cause for celebration. When paddling the kayak certain limitations are excepted so a relatively small light superzoom is usually what is taken. It’s easy to tuck out of the way and if it happens go swimming it’s not the end of the world. 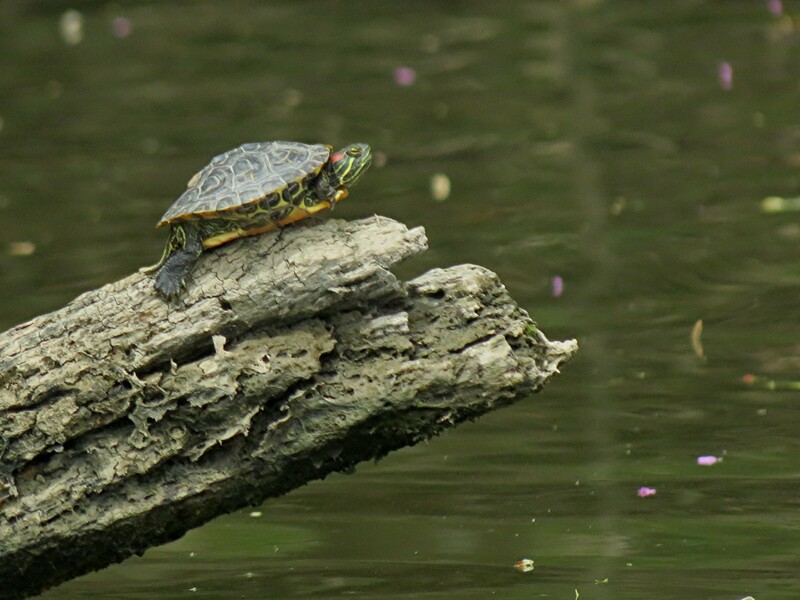 Very small Red-eared Slider getting ready to attempt a double-backflip with a twist , Griggs Reservoir. 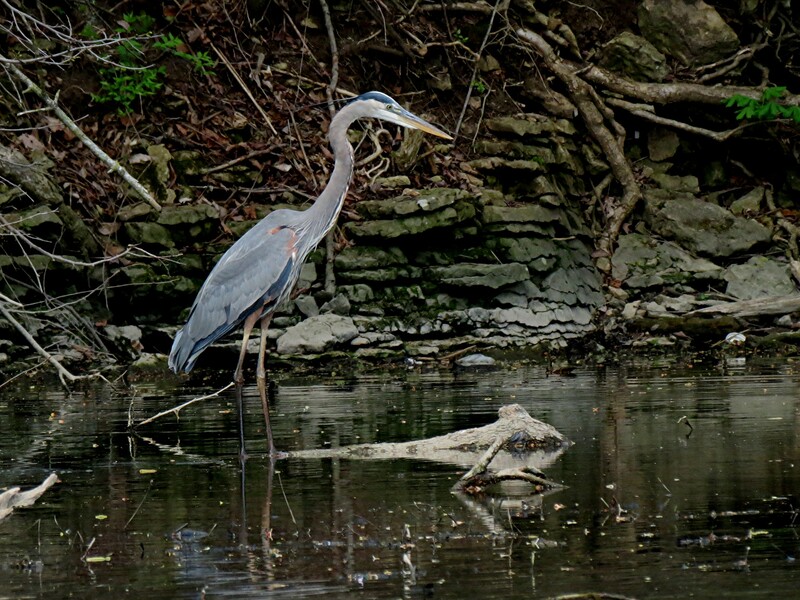 Great Blue Heron in breeding plumage, Griggs Reservoir. 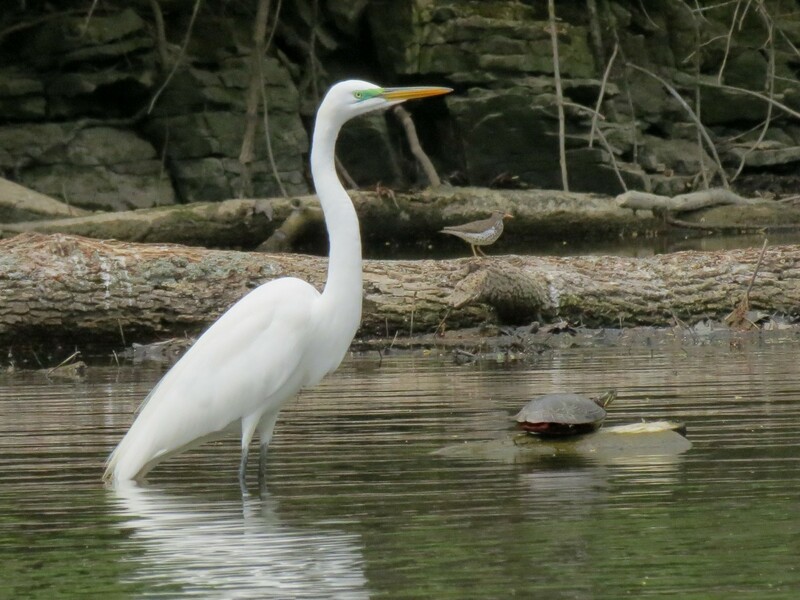 Great Egret in breeding plumage with a couple of close friends, Griggs Reservoir. In the last week not far from our home it seemed that no matter which way we turned there was something wonderful to see. We hope that’s been your experience also. Thanks for stopping by. Should you wish, prints from various posts may be purchased at Purchase a Photo. Wishing for Green But . . . Recently we visited one of our local metro parks for what turned out to be a more difficult than expected hike. 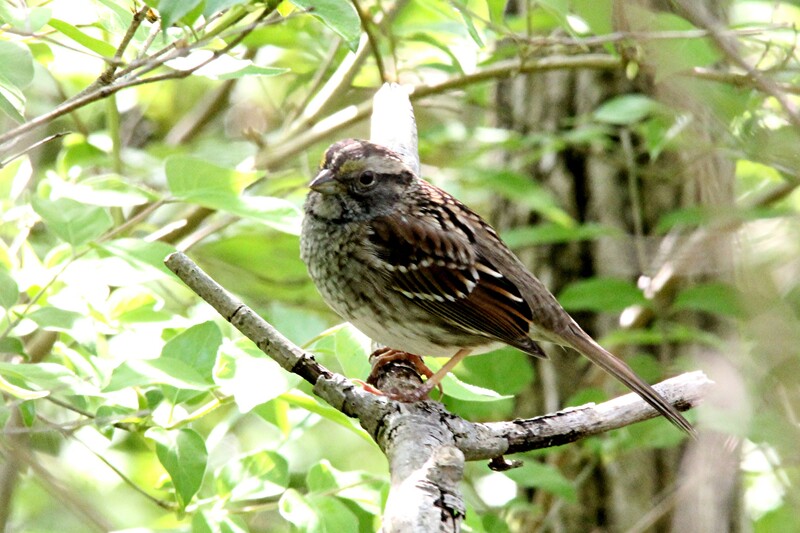 The idea was to look for spring wildflowers and migrating warblers. 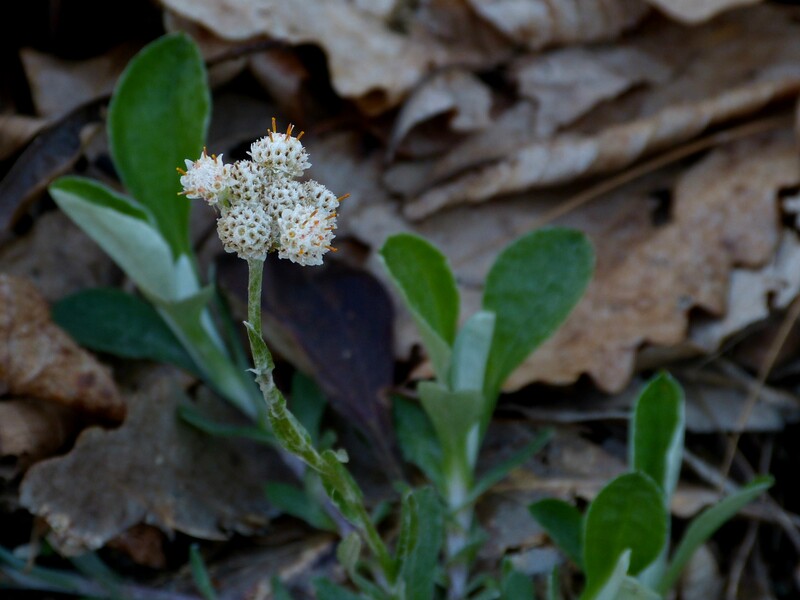 A few days later, after recovering from the hike, we found ourselves paddling the shoreline of a local reservoir again looking for signs of spring. 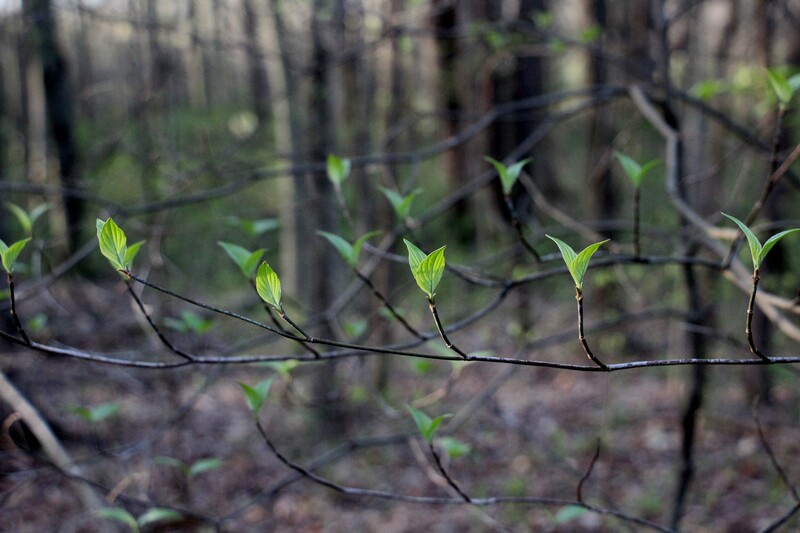 Most trees have yet to leaf out which, as the days slowly go by, leaves us wishing things would hurry up. It’s hard not to embrace the idea that nothing says spring like green translucent leaves “stain glassed” by the shadows of branches and light from a low morning sun. 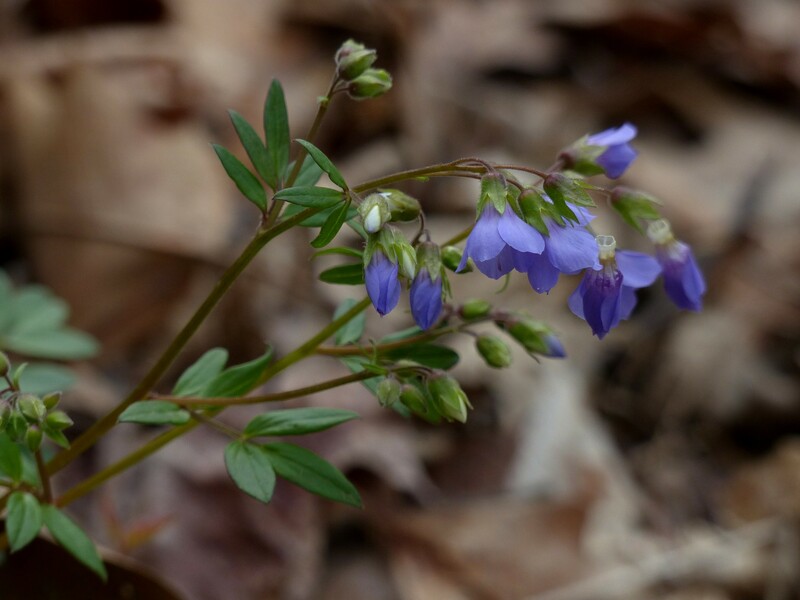 However, if one is a wildflower enthusiast you want those ground dwelling plants to have their time in the sun, so no leaves for awhile please. 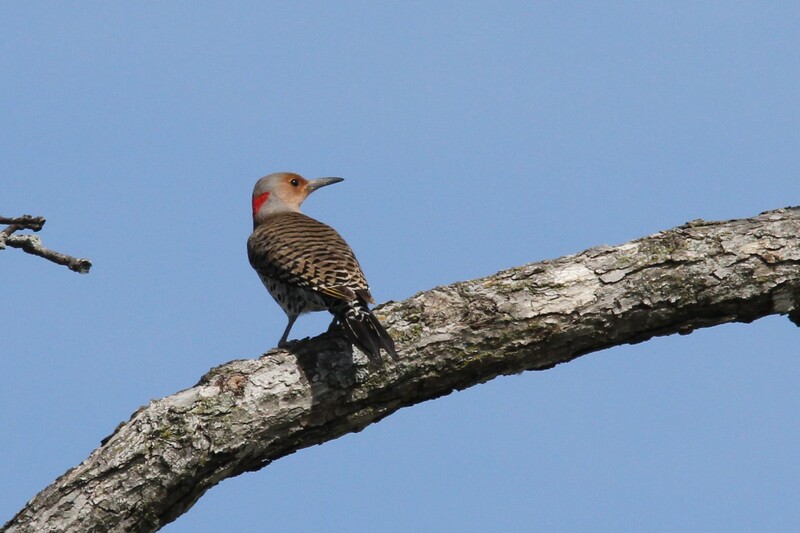 Besides, the bare branches also make migrating birds easier to spot. We have started hearing, and sometimes seeing, warblers along with a few of the other small migrants. Yellow-throated Warbler, Kiwanis River way Park, (Donna). Donna finally got her kinglet! Golden-crowned Kinglet, Griggs Park. Larger birds were also in attendance. Red tail Hawk seen along the shore of Griggs Reservoir while paddling. Double Crested Cormorants and Great Blue Herons occupied the trees on a small island, while paddling the north end of Griggs Reservoir. One heron appeared to be eating something. 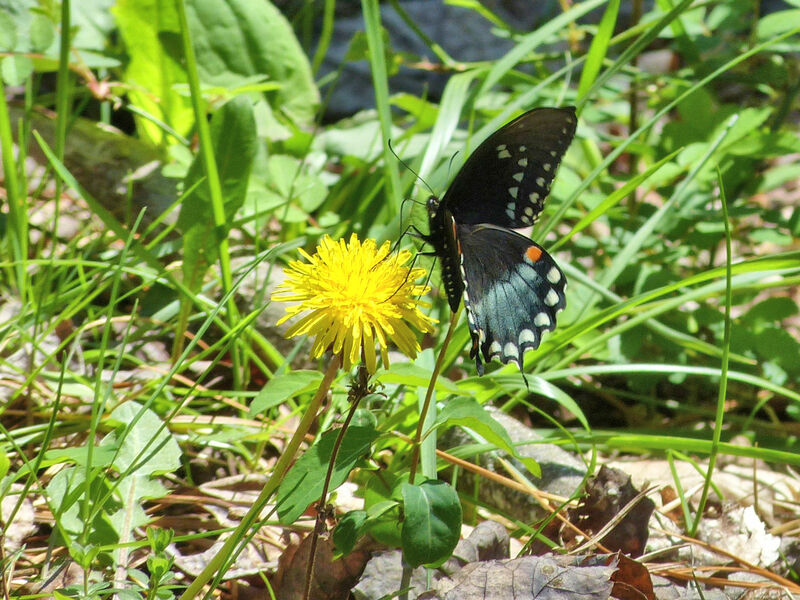 Warmer midday temperatures mean more butterflies. They are also seen earlier in the day, defying what seem like way too cool temperatures. 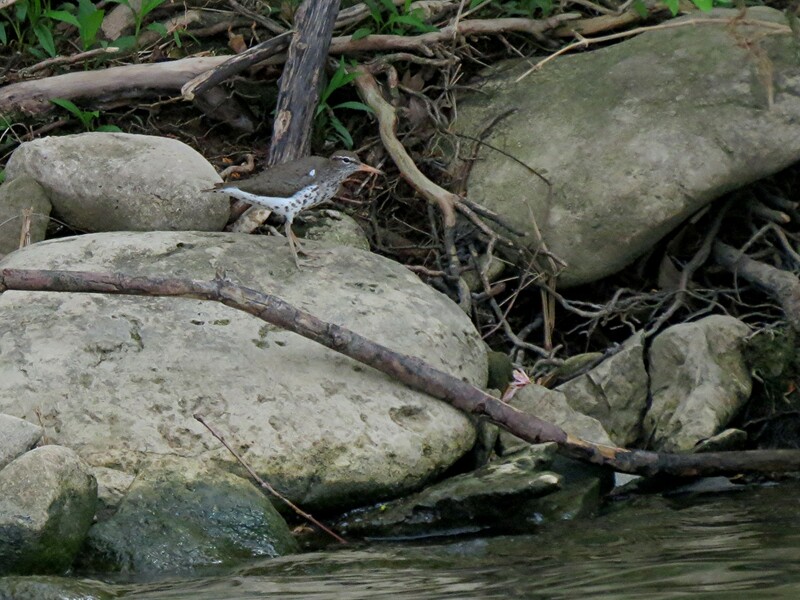 Below are three of the many species seen in recent days. 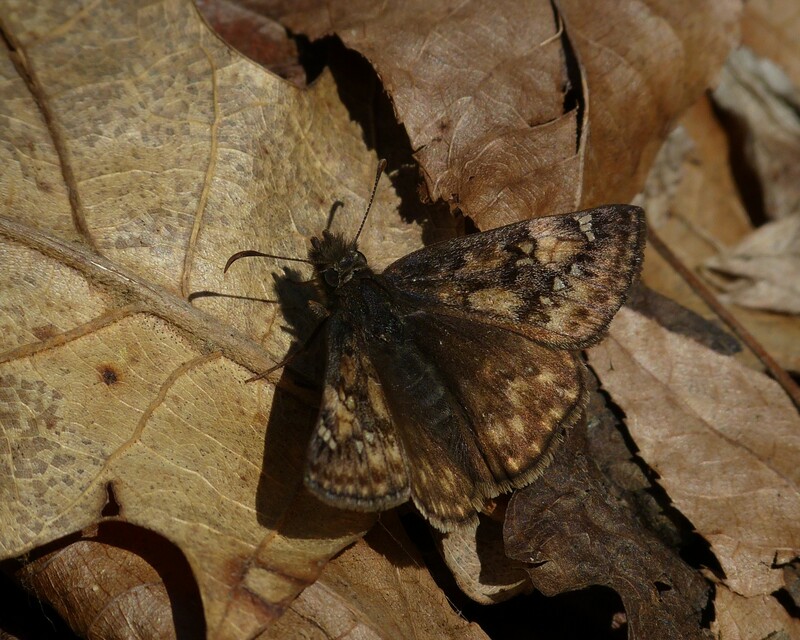 While the canopy is still bare there are things to be seen on the forest floor. 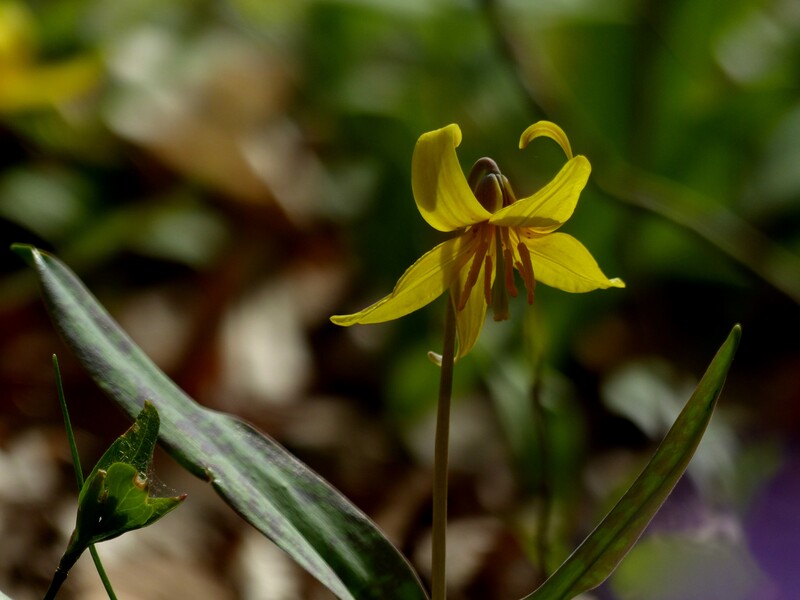 Trout Lily couple, Griggs Park. A dandelion goes to seed, Griggs Park. Large Flowered Trillium, Griggs Park west, (Donna). Club moss, Clear Creek Metro Park. 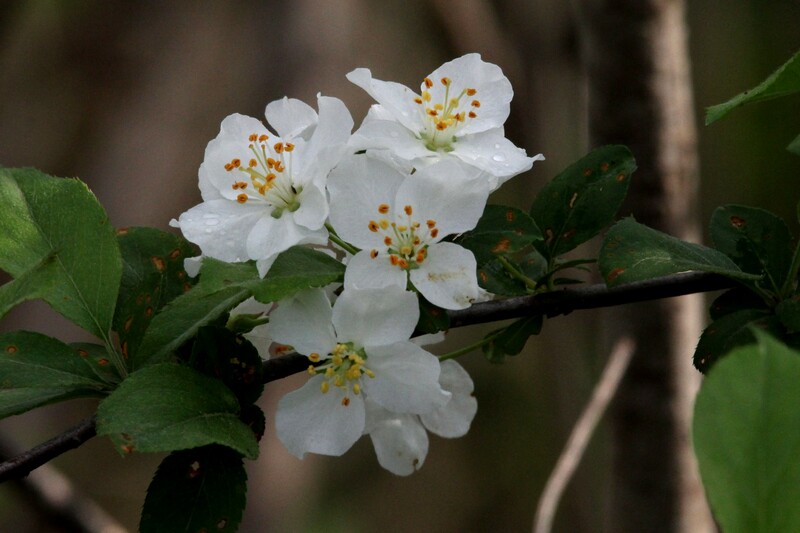 Today, a hike in Clifton Gorge treated us to more beautiful wildflowers, but they will have to wait for another post. We were on the reservoir early, just as the sun was starting to filter through the trees. There was no wind. Resting your paddle for a quick look around, the canoe, with small ripples, continues moving quietly, just as you left it. 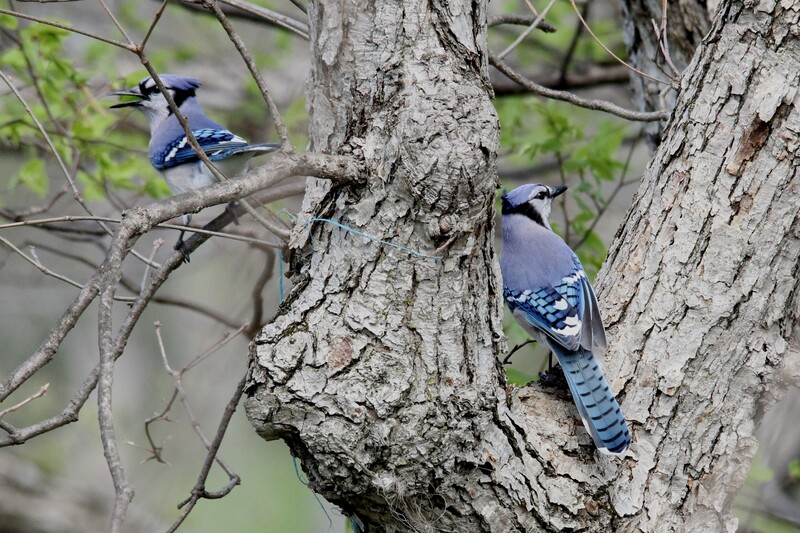 A perfect day to see birds as we glided along the wooded shore. It wasn’t long before we were hearing birds. In fact we were hearing a lot more than we were seeing. But as is often the case when canoeing on the beautiful morning, it’s tough to complain. But as we continued to look we managed to catch a Great Crested Flycatcher. A little further, we pulled out to look for wildflowers. Sometimes getting out of the canoe to explore the shoreline presents a bit of a tripping hazard. Not long after, back in the canoe, we spot a sandpiper. Normally so common as to be a nuisance, it was hard not to admire the parenting skills of Canada Geese. In the middle of the lake a male Wood Duck let’s us get close enough for a photo. But one picture was enough. We finally reach the Osprey nesting area and noticed a least two pair were now nesting in trees along the shore rather than on the nesting platforms situated in the lake. Pretty exciting! Several different types of swallows were seen. These two posed. We paddled up the creek and looked for a spot to pull out for lunch. The river flowed quietly, dragonflies cruised by but didn’t land, and a House Wren announced it’s presence, as we ate. Others were also enjoying the river. As we headed back to our launch site the warm sun had started to draw turtles out of the water. Being a rather large reservoir with many inlets, there’s always another one to explore. We arrived back at our starting point with tired bodies but rested spirits.